It takes a village to make a superhero. This is apparently the lesson that Tom Holland learned while auditioning to play Spider-Man. He called in every favor and looked for every opportunity he could to make his case to Marvel that he was the guy for the job. Luckily, he found several people looking to help him out, including The Punisher and Thor. The Marvel Cinematic Universe is getting so large that you can’t swing a dead cat in Hollywood without hitting multiple people who wear tights, at least part time. The benefit of this, is that when you’re an actor auditioning for a role with Marvel Studios, odds are you know somebody who already has one. Such was the case when Tom Holland was auditioning to play Spider-Man. He had previously worked with Thor himself, Chris Hemsworth, as part of Ron Howard’s seafaring epic In the Heart of the Sea. According to the New York Daily News, Holland reached out to Hemsworth and asked the god of thunder to put in a good word for him with the higher ups at Marvel. We already know what the actor said, as he told us personally a few months back that he had nothing but praise for Holland’s work ethic. While we’re sure Chris Hemsworth’s opinion carried some weight, we also know that Tom Holland didn’t simply wait around after that. 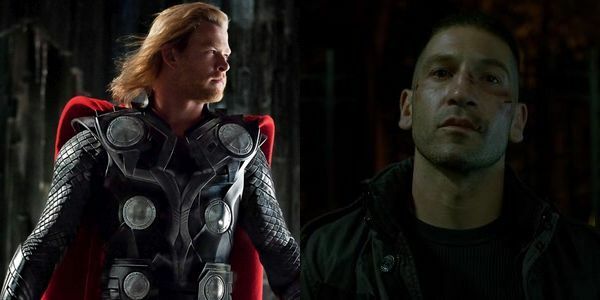 When the actor found himself filming the 13th century period drama Pilgrimage with Jon Bernthal, the man who wanted to be The Punisher at the same time that Holland was working toward becoming Spider-Man, the two decided to work together in order to make their audition tapes better. It’s a fitting pairing considering The Punisher’s first comic book appearance was inside the pages of The Amazing Spider-Man. The trick worked, as both men ended up scoring their respective roles. Now we're anxious to see them both in action! Tom Holland’s campaign to be the next Spider-Man was an epic one. After the Thor favor he called in and the audition tapes with The Punisher, we also know that he pushed his gymnastics background hard, including something physical in every tape so that Marvel knew he would be capable of doing the job. We can imagine the sigh of relief that the actor made yesterday when he finally saw himself in the most recent trailer for Captain America: Civil War. What did you think of Spider-Man MCU debut? Everything you wanted it to be? Let us know below. And if you loved it, thank Thor and The Punisher.